Last week, on our first visit to the Namdaemun Market in Seoul, Danielle and I were introduced to hoddeok, one of many yummy street-fare treats found in Korea. We found ourselves at the market again this week, (Christmas shopping) determined to sink our teeth into the little round “cakes” one more time. Hoddeok is essentially a small pancake stuffed with a gooey brown-sugar-syrup filling. It is sweet, delicious, and just the right size to make it a perfect snack. One caveat though: be careful when you eat it because the filling tends to ooze out and get all over your curly hair and jacket…I think I’ve said too much. 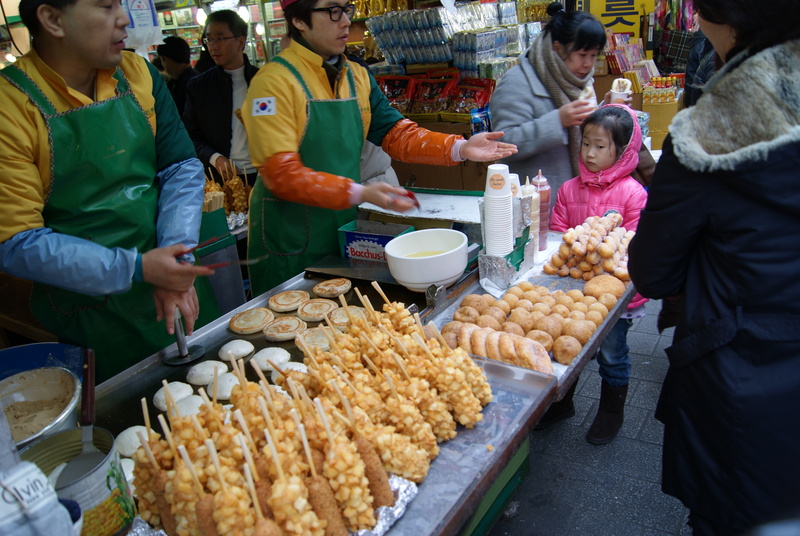 In the picture above, hoddeok are the small, round pancake-looking things on the grill. Mmmmmm.